Rebecca Penn concentrates her practice in the areas of civil litigation, business law, land use and school law. Prior to joining Livengood Alskog, she acquired significant litigation and trial experience representing hospitals, utility companies and large commercial insurers. Rebecca is not only able to advance her clients’ interests in their day-to-day operations, she can be a powerful advocate in any court. Rebecca also knows the risk and expense of trial and therefore works to negotiate more cost effective strategies to resolve disputes. She represents a number of business clients and construction contractors overseeing all manner of legal issues including defending private civil claims, City code violations, employer/employee matters, independent contractor relationships, business agreements and transactions, commercial leases, real estate, land use, construction liens and professional service employment contracts. She also represents private individuals in land use matters. Rebecca provides counsel for public school districts on a wide range of issues, including policy advising and drafting, student privacy rights, special education counseling and dispute resolution, FERPA, and pre-contractual compliance, including student privacy and technology, compliance with state and federal education laws, employment issues, student discipline and First Amendment rights. Rebecca both defends and brings claims under the Public Records Act. I am a busy physician specialist practicing in a large multispecialty group. I asked Rebecca Penn to review my employment contract including the noncompete agreement which was very difficult to navigate without a legal background. Ms. Penn clearly drew from prior experience negotiating contracts when she returned an addended contract to me and explained her edits in detail. She pointed out the places where I was left exposed. She offered the right advice addressing my needs and leaving me protected. The result was a great success as the addended contract was accepted. I am grateful to Ms. Penn for her legal expertise and professionalism. I own a business in Kirkland ,WA and have been working with Rebecca Penn Since 2015. Rebecca is very organized, prepared, timely and very easy to work with. She did an excellent job in court and happy to report our case was settled in our favor. Represented several small business owners in lawsuits against former employees for breaching non-competition contract clauses. Each case resulted in permanent injunctions against the employees’ misconduct, protecting businesses’ clientele. Successfully defended a commercial property tenant in a lawsuit brought by a landlord for breach of commercial lease. Represented client in bringing a Public Records Act case against a county, achieving resolution to the benefit of her client. Represented public hospital district in defending a Public Records Act case, achieving resolution to the benefit of the hospital client. Defended public school district against parent’s appeal of administration decision under Family Educational Rights and Privacy Act, achieving decision in the district’s favor. Successfully represented a university student client through appeal to overturn an adverse disciplinary decision under the Student Code of Conduct. Successfully appealed an attempted revocation of sports club membership rights under the club’s code of conduct. Represented physician clients to negotiate more favorable employment contract terms following acquisition of hospital employer by another healthcare provider. Represented property owner in trespass and property damage claim against the Washington State Department of Transportation with early case resolution to the benefit of client. Represented property owner to successfully preserve the use of an easement during foreclosure proceedings of servient estate. Successfully defended a property owner in a breach of purchase and sale agreement lawsuit based on misrepresentation claims under a seller disclosure. She was able to get the case dismissed at an early juncture to the benefit of her client. 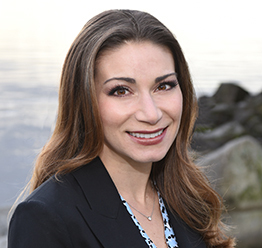 Rebecca is invested in the vibrant city of Kirkland and surrounding communities of Kenmore, Bothell and Bellevue. She has a husband with an orthopaedic practice here and they are raising their two young children who are future students in the public schools. She spends much time at the local parks and outdoors with her family, hiking and boating on Lake Washington.